Some months ago Oriflame had launched their The ONE range of cosmetics which have some amazing and worth try stuffs. I have already reviewed The ONE Lipsticks , The ONE Nail polishes and The ONE blushes in my previous posts. And today I will tell about their Colour Impact Cream Eye-shadows.. There are total six shades they had launched which are really pretty ,and I have three of them to review today. The shades I have are, Olive Green, Intense Plum and Golden Brown . So here in this post I will only swatch the shades and will try to do tutorials on these same in some other posts. So let's move to know in details about these beauties . Price : Rs449/- for 4gm. 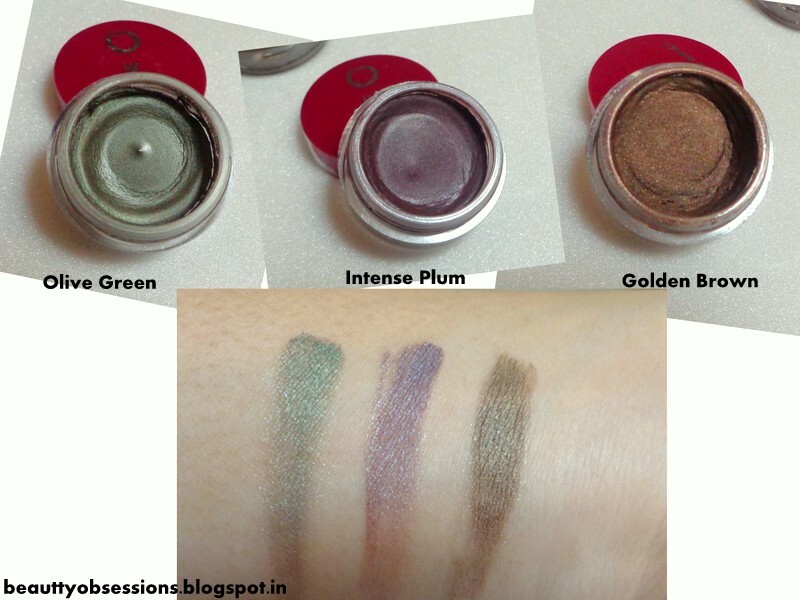 Oriflame The ONE eyeshadows come in a tiny round tub with maroon colour screw cap. The tub is transparent which allow you to see the shade easily . I love the tiny cute tub .. It is very easy to carry around while travelling. Texture wise these are creamy to powdery finish. These are creamy on application (and look wise) but set into powdery finish. These cream eyeshadows are great for using as eyeshadow base as they don't crease at all. These are far better than the Maybelline Colour Tattoo ones. These are really pigmented and with a proper base (if you are using them as eyeshadow) these shades look really amazing otherwise the shades are best for using as eyeshadow base if you are planning to use any powder eyeshadow on it. These stay for good 5-6hours on my eyes. Though the price is on its high side,we can't ignore its quality and performance as well. Olive Green: The shade name explains everything. It is a really beautiful olive green shade which will flatter all complexions,but fair skin girls will rock it. Intense Plum: A gorgeous egg plant purple shade which will look amazing on Indian skin tones. Golden Brown: It is a brown eyeshadow with copper and gold touch . A very pretty and everyday wear shade which also perfect for making smoky eye look. Price is on high side (but you can get them during in offer and oriflame gives offers most of the time).